Enter notes with the built-in virtual keyboard or fretboard, a MIDI keyboard or by tapping on the score. You can also play instruments without editing to test out phrases before notating. 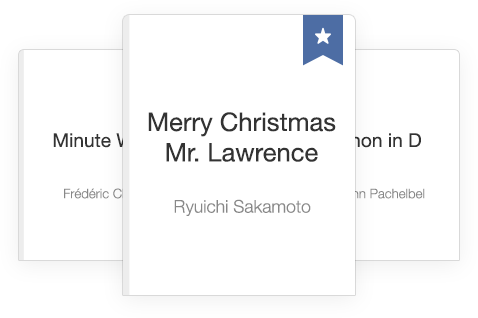 Simple gestures let you start, stop, and loop playback with ease. 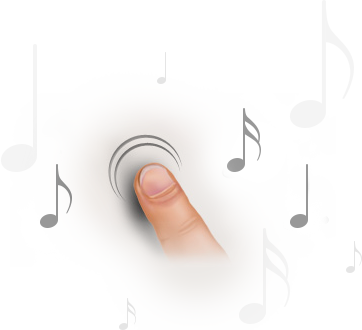 Play with a metronome, set the tempo, or use the mixer to adjust volume for individual tracks. Create up to 15 instrument tracks, 4 voices/layers, and 48 staffs for each composition. Symphony Pro includes 118 carefully tuned instruments — a wide selection of keyboards, strings, guitars, bass guitars, woodwinds, brass, percussion, and synths. Listen to an Exported Track, which sounds exactly as you would hear in Symphony Pro. Advanced Notation Editor Tools let you select, cut/copy/paste, undo/redo, insert/delete, and rearrange everything from notes, measures, to tracks with ease. Embellish your piece with a wide selection of dynamics, articulations, markers, and other notational elements. Also included are tools for lyrics, text, and chord symbols, which intelligently transform and format your inputs so you don’t have to. 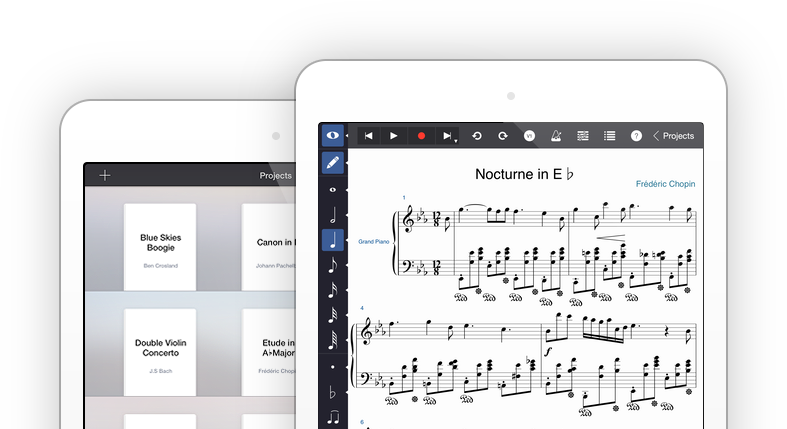 Enter notes with the built-in, full-sized, piano keyboard. You can also hook up any supported Core MIDI keyboard to your iPad and begin playing right away. Want to edit notes with a fretboard? You can do that too, by using the built-in guitar. Simply tap on the fret and string of the note you want to enter. You can enter notes in standard music notation or tab notation. Selecting chords will highlight its string and finger positions, making it easier for you to read and edit. You can also enter notes in realtime with the MIDI recording tool. Your performance will be transcribed into music notation as you play. Set the recording tempo to whatever you’d like. A metronome will play along with you to keep track of the beat. Enter score info, adjust scales and other display settings. Navigate through your score with continuous scroll mode or by flipping through pages. Hide or show selected tracks. View your piece in landscape orientation, or flip your iPad up to enter vertical screen mode to view your composition in full screen, just like sheet music. Start a new project from scratch with the tap of a button, in seconds by choosing built-in or custom templates, or import MusicXML, MXL, MIDI, and Symphony files from elsewhere and begin editing right away. Collect and manage your projects in a beautiful bookshelf display or switch to a list view to track down a score using the built-in index. Export your project as a PDF, MusicXML, AAC, MIDI, Photos, or Symphony file. Send via e-mail or save to your iPad and transfer files seamlessly to your desktop with iTunes File Sharing. 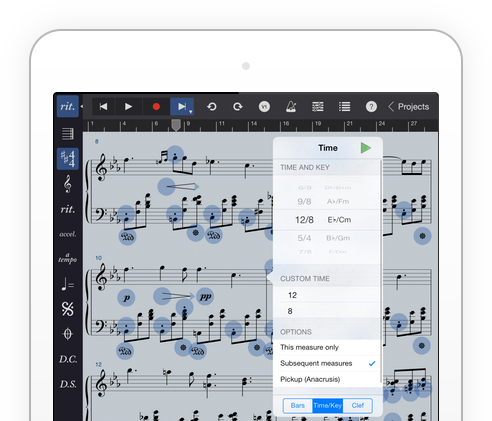 You can also print the entire score from your iPad with AirPrint. Symphony Pro also supports your iPad’s AirPlay streaming and mirroring features, allowing you to stream music or share your screen wirelessly to compatible devices. Export audio tracks to SoundCloud and share your compositions with others on Facebook and Twitter. A globally redesigned look-and-feel for iOS 7. Dozens of improvements to interface transparency. A revitalized mixer panel interface. The Master Track Menu, allowing you to edit reverb, swing, and other playback parameters to create a finely tuned performance. 6 New instruments: Bass clarinet, Xylophone, Marimba, Accordion, an additional Pick Bass sample, and an ocarina. Track-wise pan customization. Use the mixer to modify each track's stereo balance. Track-wise envelope customization. Use the mixer to modify the track's gain envelope in real time. Drag and transpose multiple notes at once. Select and edit the properties of multiple notes simultaneously using the Fine Edit tool. Tap on an existing note or select a group of notes, and tap "Edit" from the selection tooltip to open. From a note selection, open the Fine Edit tool to create a cross-staff beam from the original staff to the staff that is above or below. Switch between different enharmonic spellings using the Fine Edit tool. When switching between concert and transposing pitch, the original enharmonic spellings are now preserved. When selecting staff(s) using the copy and paste tool, you now have the option to highlight the notes under the selection. This allows you to transpose or edit the selection using the Fine Edit tool. With the copy/paste menu open, you can now select all parts by tapping the corresponding tooltip option. Place any number of chord symbols in empty bars or otherwise unattached to any existing note. To add them, just switch to an empty layer, tap on the chord symbol icon, and tap anywhere inside a measure. Customize the positioning and shape of slurs. Positionings are preserved even if you change the layout or size of your score. Cues are now available in the notehead expandable button. Over a dozen new articulation symbols, including tremolos, a variety of different trills, caesuras, breath marks, and paired symbols. For newly created articulations and dynamics, positions are preserved regardless of the page scale. Use the Navigation Ruler to move to different sections of your project efficiently. 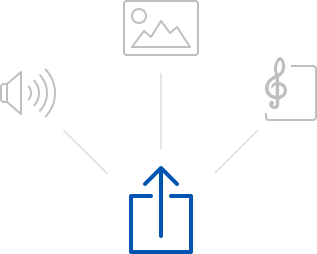 Tap and hold the forward transport button to activate it. Tap again to dismiss. In horizontal (continuous) scroll viewing mode, the clef and key are drawn automatically in the left-most measure, such that these score elements are readily visible. In the same mode, you can use the navigation ruler to set your position in the score as you drag the tracker. Use the Score Colors Menu to customize the background. We will be adding support for notehead colors and a larger selection of score background colors in our next update. Turn tuplets on or off. Overdubbing support for recording using multi-voice. Use SoundCloud Integration to export a selected project as a private or public audio track. Use the SoundCloud export menu to share your projects via Facebook, Twitter, and more. Visit our forum page for a list of resolved issues. Get the essential features of Symphony Pro at the palm of your hand. Our latest iPhone app allows you to transfer projects between your tablet and smartphone. Visit symphonypro.net/iphone or the App Store page for more details. Be among the first to know about important news and updates for Symphony Pro. © 2014-2015 Xenon Labs, LLC.